There were no major changes in the situation in Syria since our last post. 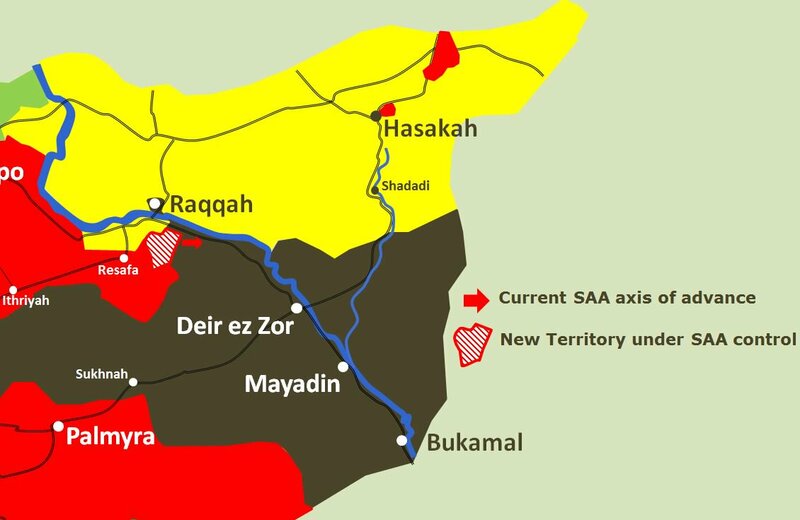 Several smaller steps have further consolidated the position of the government of Syria and its allies while the positions of its enemies continue to deteriorate. In the north-west Idleb governate and the city of Idleb saw new infighting between Ahrar al-Sham and al-Qaeda in Syria under its current moniker Hay’at Tahrir al-Sham (HTS). Ahrar, historically also an al-Qaeda offspring, was supported by Qatar and Turkey while al-Qaeda in Syria (aka Jabhat al Nusra aka HTS) was said to have support from Saudi Arabia and Kuwait. Rudiments of local CIA paid Free Syrian Army gangs are intermixed with these. Their primary task was to collect supplies from the CIA in Turkey and to distribute those to their friends in al-Qaeda and Ahrar al-Sham. Each of these groups received support in the range of at least $1 billion per year. The spat between Qatar and Saudi Arabia mostly ended their interest in their proxies in Syria. The Trump administration decided to end the CIA support program for its FSA proxies in the north-west (but not for others elsewhere). This was a significant change of the situation for each group. After losing their paymasters the local FSA gangs melted away. Ahrar held on to the border crossings with Turkey and collected “taxes” for everything that went through them. Al-Qaeda in Syria needed money. It attacked Ahrar al-Sham to eliminate the competition and to gain control over the only income source left. Last week al-Qaeda overran nearly all Ahrar al-Sham positions. It managed to capture and hold the Bab al-Hawa border station with Turkey. It also controls all other border stations. Taxing all trucks going through is a very significant sources of money. Al-Qaeda will now feed off all im- and exports between the Idleb area and Turkey. Ahrar al-Sham is practically done. It lost most of its weapon and ammunition storages and several subgroups left to join with al-Qaeda in Syria. In an effort to support Ahrar al-Sham Turkey transferred some of its Syrian proxies from the Euphrates Shield area it holds north-east of Aleppo towards the Turkish side of Idleb border station. But those forces are too few and too little motivated to take up al-Qaeda in Syria. Ahrar is now too depleted and weak to win and control Idleb. The Turkish move was too little too late. 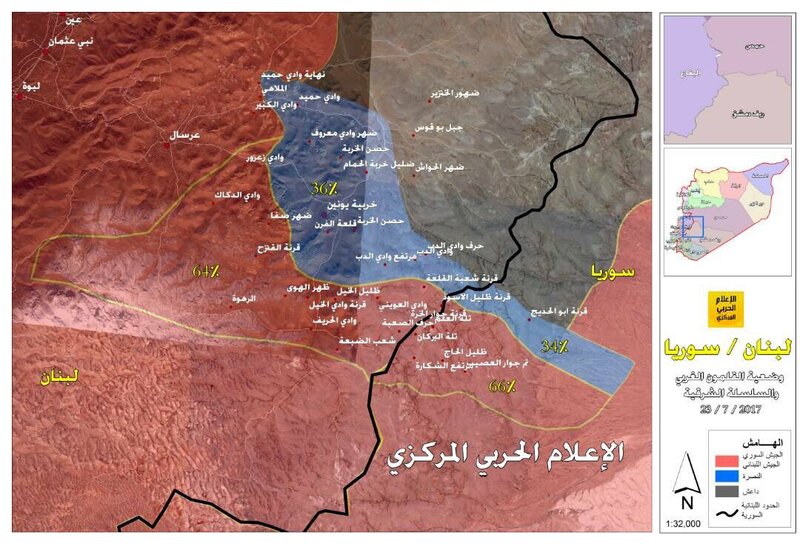 Idleb is now for most parts consolidated al-Qaeda territory. The usual “expert” propagandists have long claimed that Ahrar and Hay’at Tahrir al-Sham (HTS) had no longer anything at all to do with the original al-Qaeda. But today al-Qaeda central published a letter that asks both of these groups to stop there infighting. What will those propaganda goons make out of that? South from Idleb a pocket of various insurgent groups (Ahrar, al-Qaeda, ISIS) controls the mountains around the Lebanese city of Arsal right next to the border with Syria. In June several Lebanese army personal were killed in the area. The Takfiri insurgent groups are a continuing danger to Lebanon as well as to Syria. Several offers for their transfer to Idleb were rejected. Last week a united front of Lebanese and Syrian forces started to clean up the pocket and to eliminate all insurgents in area. The Lebanese army took control of Arsal city and will protect it against infiltration. About 5,000 Hizbullah fighters were allocated to attack the insurgents within Lebanon while 3,500 Syrian army personal will mop them up from the Syrian side. The Syrian air-force provides support within Lebanon and Syria. The Hariri government of Lebanon (a Saudi puppet) as well as the U.S. have agreed to the operation. So far it ran without a hitch. After several losses on the first day Hizbullah gained significant ground (see map below) during the last two or three days. Nearly half of the insurgent area is already under control and it will not take long for the rest to be liberated. 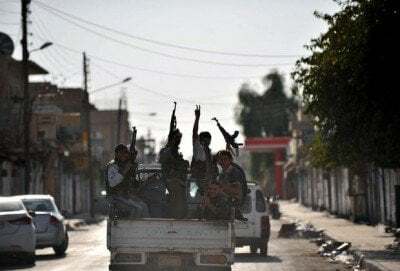 Those insurgents who do not want to get killed and give up their fight may be send to Idleb where they can join the infighting between their brothers. The U.S. and Russia had agreed on a deescalation zone further south next to the border with Israel and Jordan. While Israel was consulted on the issue it later voiced disagreement. The Israeli government wants a permanent U.S. forces in the area to cover the Israeli occupation of the Syrian Golan height. Neither the Trump administration nor the U.S. military have any interested in such a costly entanglement. Israel has long paid, supplied and supported Takifiri groups in the area. It gave them fire support whenever they were in fighting the Syrian government forces. The deescalation agreement foresees the supervision of the deescalation area by Russian military policy. That regime will be installed during the next few weeks and further Israeli shenanigans in the area will become difficult. Russia will react harshly against any interference with its troops’ task. U.S. Defense Secretary Jim Mattis last month left open the possibility of longer-term assistance to Kurdish YPG militia in Syria, saying the United States may need to supply them weapons and equipment even after the capture of Islamic State’s Syria stronghold of Raqqa. The question remains: how can new Kurdistan states” survive with four countries surrounding it (Iraq, Syria, Turkey and Iran), all determined to do everything to neutralise a future Kurdish state in Mesopotamia and/or Bilad al-Sham? 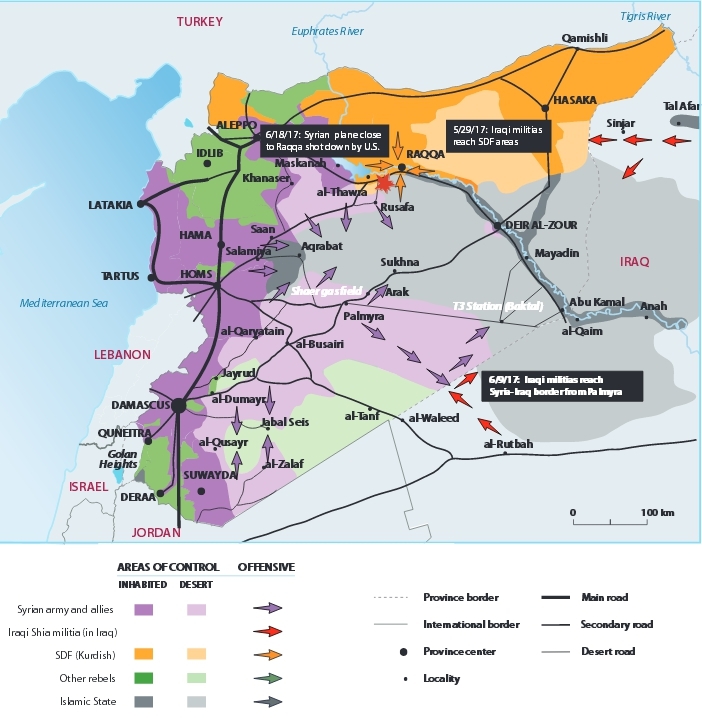 The Kurds really believe they can rely on two US and one British military bases in Kurdistan Iraq and on Saudi Arabia monies, and on six US military bases in the north of Syria to impose their “state”? The YPG/SDF has already huge difficulties to defeat ISIS in Raqqa. There is little progress but the losses are considerable. Last week it had to discontinue its attack and wait for fresh forces to arrive. Raqqa is only a medium size city but with many high-rise buildings and a still significant population. Bombing support by the U.S. and heavy artillery shelling will be requited to eliminate ISIS from the city. This may well take several additional months. The city will be destroyed and the attacking Kurds will have high losses. There will be many civilian casualties. All this for a city that even after ISIS is defeated will never submit to Kurdish control and will eventually fall back to the Syrian government. One wonders how the political leadership of the YPG will justify this costly effort when questioned by its constituency. On the southern bank of the Euphrates the Syrian government forces have now encapsulated the SDF forces around Raqqa. They make continues progress towards Deir Ezzor where a Syrian government forces is still under siege of ISIS. The Syrian government attack against ISIS around Deir Ezzor will come on multiple axes. But there are still some 80 kilometers to go and even though the area is mostly an empty semi-desert ISIS commandos are still active there. Only last week some 25 Syrian soldiers were killed in one ISIS commando attack at the T-3 pumping station near Palmyra. Lavrov also warned against any thoughts of establishing permanent U.S. bases in Syria.